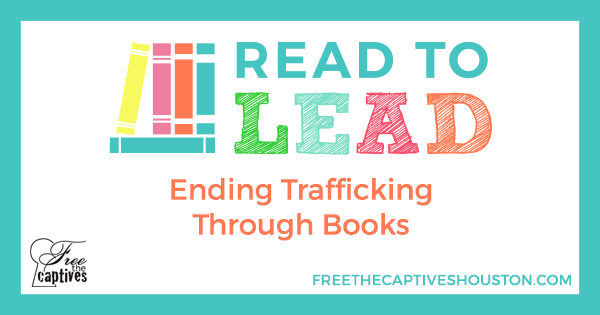 Read to Lead: Fighting Human Trafficking One Book at a Time! Free the Captives is excited to launch our new literacy program that will break the cycle of poverty and change generations within teen trafficking victims’ families. The sad reality is that many of our teen trafficking victims are coming out of this environment with unplanned pregnancies. To create a better life for these children, we want to help them develop a love for reading. Those who don’t read proficiently by the 3rd grade are 4 times likelier to drop out of school. Reading to children as infants and toddlers will increase their literacy skills and better prepare them to succeed in school. How will Read to Lead work? We are asking the community to donate each month new books from our reading list and gift certificates as incentives. Free the Captives will provide our trafficked teens and their child with these new books. Our trafficked teens will be encouraged to read at least one book to their child each night. After turning in a reading log every two weeks, the teen can earn incentives such as gift certificates to be used towards diapers and wipes. The teen will build up her own library and help her child develop literacy skills and a love of books! Do you want to break the cycle of poverty that contributes the human trafficking of teenagers? Each month, donate a new book from our reading list or $20 Walmart gift card. Questions about Read to Lead?